Take Me Out to the Daytona Tortugas Ball Game! All around the nation, flowers are blooming, temperatures are rising, and the aroma of grilled hot dogs fills the air. It all signifies one thing: Baseball season is here.The same will soon be true of Daytona Beachwith the Daytona Tortugas season opener set for April 5. The team, a Cincinnati Reds Class A-Advanced affiliate, plays at the historic Jackie Robinson Ballpark on the banks of the Halifax River. Enjoy America’s favorite pastime on your next visit to the Daytona Beach area by taking the family to a Tortugas home game! Beyond their feats on the field, the Tortugas are also known all over for being the "Best Dressed Team" in baseball, debuting a new jersey each and every Friday throughout the season. And for its 2018 run, the team has a promotional line-up that baseball fans of all ages will enjoy! You have ample opportunity to get to a game, as the Daytona Tortugas will play 70-plus home games from April through September. 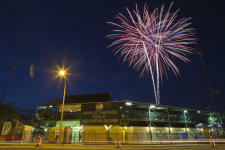 One new addition this year includes Friday night post-game fireworks shows. Now on both Friday and Saturday nights, you can experience fun that goes sky-high with a total of 24 fireworks shows throughout the season — that’s double the fireworks shows from last year! Other fan-favorite specials include Belly Buster Mondays, Taco Tuesdays and Thirsty Thursdays, which are returning this year with an even greater emphasis on the best possible fan experience. Plus, don’t miss Tiny Tugas Nights and T-Shirt Giveaways each Sunday. And of course, Jackie Robinson Ballpark is home to the biggest parties on Thursday nights, thanks to live performances that accompany home games as part of the Thursday Night Entertainment Series. Soak in some baseball, sip on an ice-cold beverage and groove to a little live music — what could be better on a warm spring or summer day? You can help the team give back to the community with the all-new Wishful Wednesdays, where the Tortugas partners with local community organizations to provide financial support and raise awareness. Come out and show your support on April 25 Cannonballs for Kayne. Funds raised will be in memory of Kayne Finley, a swimmer at Spruce Creek High School who passed away last year from cancer at the age of 18. For a special celebration of Volusia County’s own homegrown artist, mark your calendars for August 10-12. Famed “happy tree” painter Bob Ross, a Daytona Beach-area native whose namesake theme night was named as 2017’s top promotion in Minor League Baseball, is again celebrated at “The Jack” after the event claimed multiple Golden Bobblehead awards. The weekend will include fireworks, special Bob Ross jerseys, a pre-game 5K color run, pre-game painting classes and a specialty Bob Ross Bobblehead. New to the 2018 season, the Tortugas will put on the first-ever Daytona 5000 on Friday, April 13, when the Tortugas look to welcome 5,000 fans in attendance while the team dons a NASCAR-themed racing jersey. The Tortugas will also be home for Memorial Day Weekend (May 25-27), celebrating with fireworks after the games on Friday and Saturday. Additionally, the team will be wearing specialty jerseys on Friday night and honoring many of our local heroes in a Hometown Heroes Card Set to be given away to the first 1,000 fans on Saturday, May 26. Have any superhero or sci-fi fans in your family? Head to the ballpark for Star Wars Night on May 4 and Super Hero Night on June 22! The entire season is packed with fun themes and great giveaways, and you won’t want to miss them. 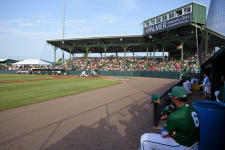 Get your tickets today by calling (386) 257-3172, and view the entire schedule at DaytonaTortugas.com. Come out and help us root for the home team — we’ll see you there!